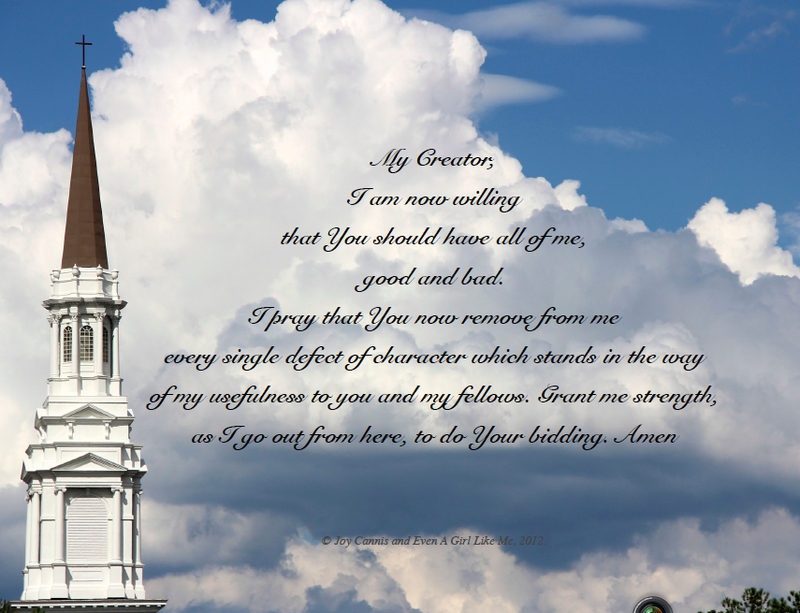 This prayer is found on page 76 in the Big Book of Alcoholics Anonymous. I have found time and time again that when I am struggling with something that is difficult to figure out, if I will look inward, the answer is usually waiting. Whether it is one that I want to hear or not. This entry was posted in Photos that Speak to Me, Prayer and tagged 7th Step, alcoholics anonymous, God, postaday, Prayer, Recovery, The Big Book by Joy. Bookmark the permalink. I do not think we are very willing to let God or anyone else for that matter to have all of us. We do not want anyone to see “all” of us. Rare do we find someone we let have all of us. When we do find that someone and let them see all of the dirt it can be special especially if they still love us no matter. It’s much easier for me to let people have the good. I don’t want them to see the bad. But they must be willing to take both. It’s not love any other way. You are absolutely right … we must be willing to love them that way too.